Cindy Torres, a shelter advocate for the children's legal program at Americans for Immigrant Justice in Miami, working with an immigrant child separated from her parents. “Ana actually is from an indigenous region of Guatemala, so she didn’t even speak Spanish,” says Anzardo Valdes, who heads the children’s legal program at the nonprofit Americans for Immigrant Justice (AI Justice). Anzardo Valdes could get a Maya language translator for Ana. But she couldn’t change the fact that Ana was barely out of diapers – which made Ana’s first hearing in immigration court a challenge. But as time wore on, Anzardo Valdes could see the separation trauma showing on Ana’s face. For a long time Anzaro Valdes got no information from U.S. officials. She eventually found out Ana’s father had been deported back to Guatemala – and that Ana’s mother had died in Guatemala after Ana and her dad left for the U.S. But meanwhile, more and more Central American toddlers started arriving at AI Justice’s doors. What the attorneys didn’t know then was that the Trump Administration’s campaign to separate immigrant families at the border was still a covert pilot program and not yet a formal policy. By the time it became official last year, children were pouring into migrant youth shelters, including three in South Florida – the largest in Homestead. “We started seeing younger and younger children – and children who were clearly so traumatized by the family separation,” says Cheryl Little, AI Justice’s executive director. Little says her lawyers now had to think like child psychologists. President Trump canceled the policy last summer amid public outcry. But his administration concedes it is still trying to locate many of the thousands of migrant children it separated from parents. And the AI Justice study examines the potentially lasting emotional scars the episode left on kids like Ana. It is for Royer – a little boy from Honduras who was separated from his father, Eric Castro, after they arrived in California in the fall of 2017. They now live with Royer’s mother Vanessa in a small, one-bedroom apartment in Miami, where AI Justice’s family defense program is handling their asylum petition. The family’s story echoes why so many Central Americans today come to the U.S. for asylum. Eric had a construction business and Vanessa was a pharmacist in Olancho – a part of Honduras all but ruled by criminal gangs. Eric says a politically-connected gangster had brutally murdered Eric’s cousin and aunt because they refused to pay his extortion racket. Then one day he came for Eric. He gave Eric – and three-year-old Royer, who was also there – two hours to obey. Instinctively, Eric felt sure the gangster would end up killing him and Royer either way. Eric put Royer on his motorcycle and they sped to the capital, Tegucigalpa. Within days they were in Mexico on their way to the U.S. border. Vanessa would join them later. So when they arrived at the San Diego crossing and presented themselves to U.S. border officials, Eric thought: “Here’s my salvation. 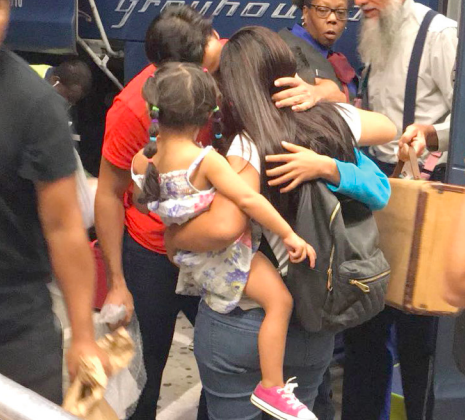 Immigrant parents and children reunited last year in Texas. Days later, agents from U.S. Immigration and Customs Enforcement (ICE) came to their detention center to take Royer. Eric clung tightly to his son, but he says the agents threatened him with a taser gun and pepper spray. “’Papi, papi! Don’t leave me, papi!’” Eric remembers, sniffling, tears welling up in his eyes as Royer, tilting his shock of black hair, rolls a toy truck across the table. An ICE spokesman says the agency cannot comment on cases that involve pending asylum requests. The Trump Administration has argued such separations followed a 1997 court order to keep children out of detention centers with adults. Either way, Royer was sent to a child migrant shelter in Texas. But no one told Eric that. Frantic, he called Vanessa in Honduras. Stunned, Vanessa immediately set out for the U.S. border herself. Early last year she located Royer, who was now with a foster family in Texas. But she and Eric still had to battle the bureaucracy to get Royer back. At that time, for example, children still had to be cleared by an immigration court before being reunited with parents – and it took time. Eventually Eric, Vanessa and Royer were reunited in Miami, where Vanessa had relatives. But Vanessa says her son, now 4, is still haunted. A 6-year-old girl named Yanci back in Guatemala after being separated from her parents for almost four months. Fredy was 15 when thugs in Guatemala threatened to kill him and his father if they didn’t join their drug gang – who, like the gangsters who terrorized Eric’s family in Honduras, operate with virtual impunity, according to Fredy’s father, Juan. So they crossed into Texas last summer – and Fredy ended up in the youth immigrant shelter here in Homestead for almost two months. “For weeks I couldn’t sleep at night, feeling like a prisoner, not knowing anything about my father and my family,” says Fredy, who now lives in Lake Worth with Juan, who says the teen still exhibits depression from the ordeal. There are, in fact, bills in Congress now that would make sure those kids in the future have a lawyer – if only to prevent the sort of anguish minors like Fredy and Royer and Ana experienced should the U.S. ever separate immigrant families again. For more than 50 years, Father Frank O’Laughlin has helped protect and promote the most vulnerable immigrants and refugees in South Florida. The Roman Catholic priest will be honored Friday night for his human rights legacy. El Edén in Honduras is no paradise for those on trek to the U.S.
SAN PEDRO SULA | It seems the entire world is wrestling with immigration emergencies today. And lest you think the western hemisphere’s crisis is over, consider the look on Oscar Ortega’s face. He just got a WhatsApp message that made his eyes pop. Some U.S.-funded programs help would-be immigrants improve their lives and stay home. TEGUCIGALPA | Here’s the first thing to know about Jessel Recinos: He’s a breathtaking rollerblader. Almost every day, Recinos skates in Cofradía Park in San Pedro Sula, Honduras’ second-largest city. He spins, makes hairpin turns and takes soaring jumps, his long locks blowing like wind socks. Kids scream his name as if he were a Honduran sports icon. Here’s the second thing to know about Recinos: He should probably be dead. Reform and beefed-up police presence is making Hondurans feel safer. SAN PEDRO SULA | On June 26, 2014, 13-year-old Andrea Argeñal had just dropped her young cousins off at school in the Rivera Hernández section of San Pedro Sula, Honduras’ second-largest city. Relatives say it’s the sort of favor she frequently did for her family.